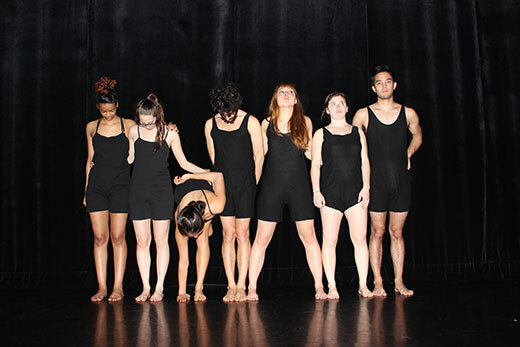 Loris Takori, Julianna Joss, Natalie Eggert, Jake Krakovsky, Aneyn O'Grady, Hannah Gold and Tim Harland will perform March 26-27 in "All Being Displaced," a dance concert choreographed by student Sarah Freeman for her senior honors thesis. Perhaps it was the spot-on descriptions of the rural Georgia landscape, or those eccentric Southern characters that seemed so peculiar, yet hauntingly familiar. Or maybe it was the sheer authenticity of Flannery O'Connor's words, a sense of kinship she felt with a writer who had lived and worked only an hour away from her own hometown. Whatever the pull, when Emory senior Sarah Freeman first read the works of the iconic Southern writer back in high school, she recalls an instant bond. "I think my imagination really connected with the landscape she describes, those weird characters that I could imagine knowing," says Freeman, who is majoring in English and dance and movement studies. Rediscovering O'Connor's work while at Emory only intensified her interest. So when Freeman sought inspiration for choreographing a dance for her senior honors thesis, she found herself turning to topics that had long intrigued her — O'Connor's life and the writings. This week, the public is invited to see Freeman blend the worlds of dance and literature at a free evening-length dance concert inspired by O'Connor. "All Being Displaced: Movement Translations of Flannery O'Connor" will be presented Thursday, March 26, and Friday, March 27, at 8 p.m. in the Dance Studio of the Schwartz Center for Performing Arts. The performance features 10 dancers in two pieces inspired by the O'Connor short story "The Displaced Person" and a solo by Freeman rooted in her research into O'Connor's personal letters and archives at Emory's Manuscript, Archives, and Rare Book Library (MARBL). "I actually didn't come to Emory thinking that I would major in dance, I loved reading and literature and was just going to focus on English," says Freeman, who recently previewed her solo at a dance conference in Milledgeville, Georgia, near O'Connor's family farm, Andalusia. "But I took a ballet class just to stay in shape and found a dance department that has both challenged me and supported my interest in English. It's been an incredible opportunity to marry my passions." In many ways, Freeman's timing couldn't have been better. While at Emory, she took classes with Anna Leo, an associate professor in the Department of Theatre and Dance, whose own interests "revolve around poetry as a structural basis for choreographic work." Leo had not only sought out poetry as a creative springboard for her own choreography, she had also assigned students to consider MARBL texts as a basis for their work. "When the Seamus Heaney exhibit arrived, it really clicked for me," Leo recalls. "Working with MARBL, we chose 20 of his poems that through rhythm, content or structure offered possibilities for inspiration." Drawing from the MARBL collection, her students produced short dances — an assignment that Leo has repeated this year, too. So when Freeman expressed an interest in using narrative text to inspire her choreography, Leo suggested a senior honor's project rooted in both disciplines. "To me, the writing process — especially poetry — is so similar to the choreographic process," she explains. "Poems are honest extrapolations. When you're creating something, you're trying to encapsulate an idea. You arrange, edit, rearrange, start over again and move things around until you find the combination that suits you." Leo encouraged Sarah to let words inspire movement. "And Sarah is such a free spirit, unafraid to experiment and open to whatever pathways might emerge. She'll try anything," she says. Last summer, Freeman had already targeted O'Connor's work for her inspiration and was working with material about the author at MARBL when MARBL Director Rosemary Magee let her know the collection would soon expand. In October, MARBL announced the acquisition of new materials from the Mary Flannery O'Connor Charitable Trust. The new archive included never-before-available writings and drawings, more than 600 letters from O'Connor to her mother, unpublished short stories, a prayer journal, diaries, family photographs and personal items. Those items — especially the letters a young O'Connor wrote while she was in college — would provide a profound influence, Freeman says. "MARBL was amazing," she says. "I remember first visiting as a freshman, but this time I was poring over material to pick up on personality, mood, the personal touch. Just to see her handwriting had such an impact on me." Throughout the process, Freeman has worked closely with Magee, who now serves on her thesis committee. "We've talked a lot about O'Connor, and I've been able to direct her to different materials. I've actually learned a great deal from Sarah and about O'Connor through this lens of dance," Magee says. Increasingly, MARBL is being utilized as a seedbed for inspiration, scholarship and teaching in the arts, according to Magee. "That's one of the great qualities of a liberal arts environment," she adds. "It encourages an enormous creativity and curiosity across the disciplines. And students like Sarah have embraced those opportunities." 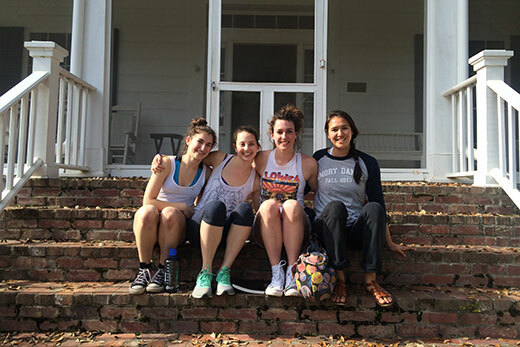 Sarah Freeman (second from right) posed with fellow Emory students Diana Bender-Bier, Julianna Joss and Natalie Eggert as they visited Andalusia, Flannery O'Connor's family home in Milledgeville, Georgia, where Freeman worked on choreography for her senior thesis. Freeman began rehearsals in earnest in September, what she describes as a "collaborative process" explored in tandem with her dancers. Two pieces in her concert are directly inspired by "The Displaced Person," an O'Connor short story thought to have been based upon a refugee family hired to work at Andalusia, her mother's dairy farm, where the writer lived from 1951 until her death from complications of lupus in 1955. "The story is extremely layered in terms of racial and class interactions and had all these characters with conflicting motives, different types of mental illness and disability, so there were so many opportunities to explore," Freeman explains. As an experiment, Freeman created two different dances inspired by the same short story. For one, the dancers were provided only "motifs or snippets of dialogue; they didn't know the full plot of the story," she says. "I wanted it to be as uninfluenced by linear plot structures as possible." Then Freeman allowed dancers to read the full text. A second dance was built upon the complete story line. Both dances will be presented separately, divided by a solo work performed by Freeman. To gain insight for her solo, Freeman visited Andalusia earlier this semester — an iconic Southern setting, with its screened porch and rocking chairs, rolling pastures and towering shade trees. Traveling from her own home in Warner Robins to Milledgeville, Freeman speculated what it must have been like for the writer "as a young person just starting life to have to move back home — her room, the grounds, it was so beautiful, but also physically confining." "For me, the solo became not so much about her illness, but about the realities forced upon her by the illness." Walking the farm, Freeman stopped to choreograph her solo on the red Georgia soil that she imagines O'Connor herself once strolled. "I really was in the middle of the woods by myself, like the modern dancer everyone might imagine," she laughs. The result is a solo that touches upon issues of displacement and disability, as well as lifelong questions woven throughout O'Connor's life and work, Freeman says. "Overall, this experience has reminded me of how proud I am to be from the South," she says. "Reading about (O'Connor's) thoughts on the South, about humor and people in her community, finding that connection with the landscape, I realize how all of that has shaped me."